« Green Shoots or Green Observers? Of course, it could be argued to the con­trary that many of those mak­ing such opti­mistic fore­casts are highly trained pro­fes­sional econ­o­mists, and not merely mar­ket com­men­ta­tors who migh have a vested inter­est in putting a pos­i­tive spin on the news. This is true–but far from being a rea­son to trust these fore­casts, it is yet another rea­son to be scep­ti­cal of them. So any­thing pub­lished by a for­mal eco­nomic body like the OECD will be the prod­uct of a neo­clas­si­cal eco­nomic model–and there­fore, in my opin­ion and that of a siz­able minor­ity of aca­d­e­mic econ­o­mists, dri­vel (there was one exception–the Bank of Inter­na­tional Set­tle­ments while Bill White, a sup­porter of Hyman Minsky’s “Finan­cial Insta­bil­ity Hypoth­e­sis”, was its its Eco­nomic Adviser). “AUSTRALIA is set to soar out of its eco­nomic down­turn sooner and more sharply than fore­cast in the bud­get, accord­ing to fore­casts from the Organ­i­sa­tion for Eco­nomic Co-oper­a­tion and Devel­op­ment under­stood to have the back­ing of the Aus­tralian Trea­sury. A lit­tle scep­ti­cism in this report would have been appre­ci­ated, given the OECD’s track record–and if a polit­i­cal jour­nal­ist had writ­ten the report, that might well have occurred. But it was writ­ten by an eco­nom­ics cor­re­spon­dent, and most of them have–like the OECD’s economists–been schooled only in neo­clas­si­cal eco­nom­ics, and don’t know how flimsy the the­ory itself is (there are excep­tions here, like Brian Tookey whose book Tum­bling Dice is an excel­lent cri­tique of neo­clas­si­cal eco­nom­ics). So we get a report like this trum­pet­ing good times and green shoots, with no irony (Peter Mar­tin was far from the only one to present the OECD’s views with­out any scepticism–see also “Earth-destroy­ing bomb defused — just” by Michael Pas­coe or Glenn Dyer at Crikey “That’ s no green shoot, that’ s Aus­tralia in full bloom: OECD”). Clearly it will take a few more pre­dic­tive and pol­icy fail­ures before eco­nomic jour­nal­ists realise that with the global finan­cial cri­sis, neo­clas­si­cal economics–and hence the OECD–is fac­ing its intel­lec­tual Water­loo. To be fair, offi­cial eco­nomic bod­ies and their uncrit­i­cal fans were not the only source of “green shoot” eupho­ria. A large part of this feel­ing that the worst was over also came from the global expe­ri­ence of a recov­ery in stock mar­kets from their recent lows. This cur­rent rally took a lot longer to start than its 1929 cousin, though it began from a com­pa­ra­ble bot­tom (55% below the peak ver­sus 48% below it in 1929), and it still has to go on for much longer and drive the mar­ket much higher to match its antecedent–let alone to pro­claim the 2007 Bear Mar­ket is over (note also that Eichen­green and O’Rourke, using global data, argue that the cur­rent decline is far worse than in the Great Depres­sion, with global mar­kets down 50% on aver­age 12 months after the cri­sis ver­sus just 10% down after 1929–see Fig­ure 2 here). Though the stock mar­ket was pro­vid­ing some good cheer in the USA (at least until last week), the real econ­omy con­tin­ued to dis­ap­point. To get an idea of just how bad the down­turn has been, and how lit­tle inkling of it that con­ven­tional econ­o­mists had, con­sider the Eco­nomic Report of the Pres­i­dent, pre­pared by the US President’s Coun­cil of Eco­nomic Advis­ers, in 2008 and 2009. The clear­est evi­dence here is that the Fed­eral Reserve’s “stress tests” for its Super­vi­sory Cap­i­tal Assess­ment Pro­gram assumed that even under an adverse sce­nario, unem­ploy­ment would be below 9 per­cent by mid-2009. It is cur­rently 9.4 per­cent. The taper­ing process that is built into neo­clas­si­cal eco­nomic fore­casts is not evi­dent in the data to date. The com­par­i­son of unem­ploy­ment rates (which Eichen­green and O’ Rourke didn’t make) bear this out: using the cur­rent OECD def­i­n­i­tion of unem­ploy­ment, this down­turn is well ahead of the 1979 reces­sion even though unem­ploy­ment started from a lower level; and using the much broader U-6 def­i­n­i­tion, which is more strictly com­pa­ra­ble to the NBER def­i­n­i­tion used dur­ing the Great Depres­sion, unem­ploy­ment now is as bad as at the same stage of the Great Depres­sion, and increas­ing as rapidly. the scale of the pri­vate debt bub­ble is just too big to be coun­tered by sub­sti­tut­ing pub­lic debt for pri­vate debt. 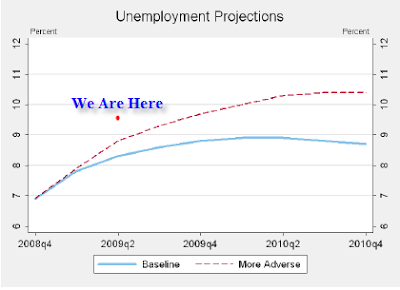 Although this report is quite gloom and doom, I think the econ­omy is slowly start­ing to pick up. At least from the point of view of self stor­age indus­try, there are pos­i­tive signs that things are pick­ing up and there are bet­ter years ahead. From the recent decrease in inter­est rates, and increase in con­sumer spend­ing, small busi­nesses should breathe slightly eas­ier soon. I’m not say­ing we should just sit back and wait for the money to roll in, but I don’t think we should sink into depres­sion and have sleep­less nights over the econ­omy. I think the gov­ern­ment res­cue has suc­ceeded in start­ing another bubble–though I think it will not last as long as the pre­vi­ous one. I’ll write a post about this shortly, using the Flow of Funds data.